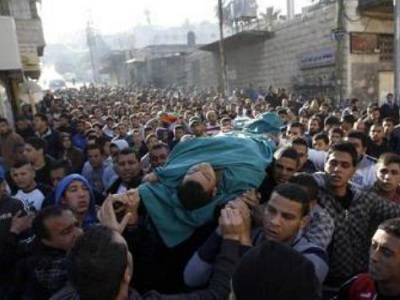 Saturday's deaths mark the bloodiest clash in the West Bank since November. Israeli army spokesman Peter Lerner called Abu Alheja “a ticking bomb” who took part in shooting attacks and was in “advanced stages of the preparation of further attacks”. Meanwhile, “Palestinians began to shoot and throw explosive devices at the troops, and as a result we have two more killed”, Lerner added. An AFP news agency correspondent said the bodies of Abu Alheja and Abu Zena were wrapped in flags of their Hamas and Jihad movements, while Jabarin was wrapped in the flag of the Al-Aqsa Martyrs Brigades, an armed offshoot of Palestinian leader Mahmud Abbas’s Fatah party. The Hamas movement in Gaza called on the PA to “end security coordination with the Israeli occupation and leave the resistance to act freely,” in a statement. Abu Alheja’s father, Jamal Abu Alheja, is a prominent leader of the movement Hamas who was been in Israeli prison since 2002. An Islamic Jihad statement issued from Gaza said the Jenin killings demonstrated that “resistance continues”. “The United States and Israel want to force the Palestinians and the entire region to surrender, but Gaza and the West Bank resist this,” senior Islamic Jihad official Nafez Azzam said. The movement called for a demonstration in the northern Gaza town Beit Lahiya later Saturday to condemn the Jenin killings and “support resistance”. A spokesman for Abbas condemned the “continuing escalation against the Palestinian people”, for which he blamed Israel. 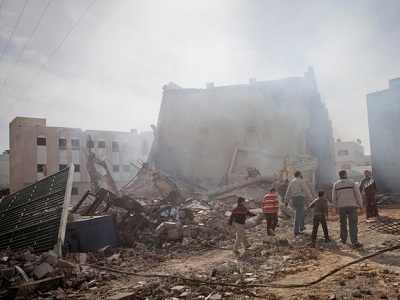 “We call on the US administration to move quickly to prevent a general collapse in the region,” Nabil Abu Rudeina said. The talks are on the brink of collapse, with Washington fighting an uphill battle to get the two sides to agree to a framework proposal to extend the negotiations to the year’s end after an April 29 deadline. Saturday’s deaths mark the bloodiest clash in the West Bank since November, when Israel killed three men it claimed were Salafist fighters.